The route out of Skipton at the start of Section Two of A Dales High Way climbs quickly onto Park Hill, with excellent panoramic views, to cross the very busy A65 bypass, before climbing onto Tarn Moor by the Craven Heifer Inn. There are a couple of OPTIONAL routes here which may interest walkers. The first leaves Skipton on a path that joins the canal alongside the castle, with impressive views of the castle defenses. This route then continues into Skipton Woods, renowned for their vivid displays of bluebells and wild garlic. 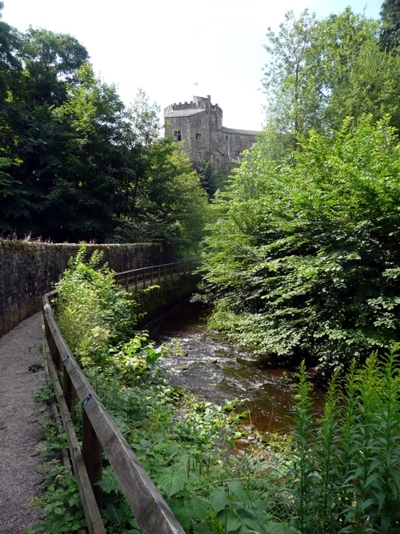 The woods are owned by Skipton Castle, but managed by the Woodland Trust who have improved access throughout. This is a permissive path - so it is possible that at some point in the future public access may be withdrawn. However, it makes for a delightful climb up past Sougha Gill onto an enclosed track called Short Lee Lane, just south of the A65. The second option picks up from here, and provides a safer alternative to crossing the A65 at this point where traffic is particularly fast. 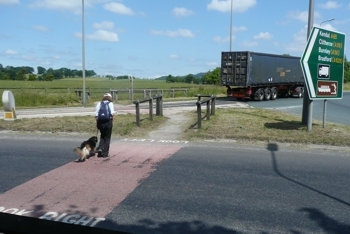 The route follows Short Lee Lane to the roundabout on the A65, where a safer crossing point can be found. The route then follows a brand new section of footpath, recently installed by the North Yorkshire County Council, which runs in a fenced off section of field alongside the busy Grassington Road up to the Craven Heifer Inn. A short section of road walking then brings you back onto the main route. The two sections combined have an added advantage - a guaranteed cattle-free route from Skipton to Tarn Moor! In addition, some newly established permissive paths (2017) link the main Dales High Way route from Skipton Golf Course to the new footpath alongside Grassington Road, with another permissive path heading north through the "green" Tarn Moor woodland burial grounds to Brackenly Lane. Skipton Castle was partly demolished by Oliver Cromwell after been held under siege by Parliamentary forces during the Civil War. It was restored by the remarkable Lady Anne Clifford and remains one of the best preserved medieval castles in Britain today, and is well worth a visit. 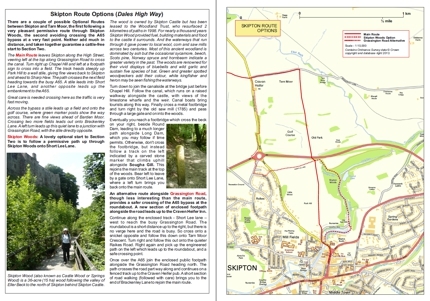 A map and route description of the Skipton Route Options can be downloaded here (PDF format).